Libya - On 12 January, during the one-day visit, IOM officials met with the leadership of the Libyan Coast Guard to discuss the outcomes of a needs assessment conducted last year. This assessment aimed to identify ways to improve the infrastructure of Libyan disembarkation points and enhance the capacity of government agencies involved in rescue operations. A work-plan for a capacity building programme was discussed during the meeting and concrete steps for the rehabilitation and provision of communication equipment was agreed. According to IOM’s Missing Migrants Project (http://missingmigrants.iom.int), 4,576 deaths were recorded in 2016 among migrants crossing the central Mediterranean trying to reach Italy. Most of the victims left from Libya. In 2016, IOM recorded 18,904 migrants rescued off the Libyan coastline. During 2016, IOM – with help from the European Union’s Regional Development and Protection Programme – supported Libyan rescue-at-sea operations in multiple ways. It helped to establish four fully equipped medical clinics to ensure quick medical assessments of rescued migrants. It also provided lifesaving equipment to the Libyan Coast Guard in Tripoli, including Thuraya satellite phones, torches (flashlights), life vests and foil blankets. It also provided the Libyan Coast Guard with 10 desktop and10 laptop computers and offered expertise in establishing a database of information on rescued migrants. Three first aid trainings and practical workshops were held for agencies involved with rescue-at-sea operations, including the Libyan Coast Guard, Port Security, Directorate for Combating Irregular Migration (DCIM) and Libyan Red Crescent. 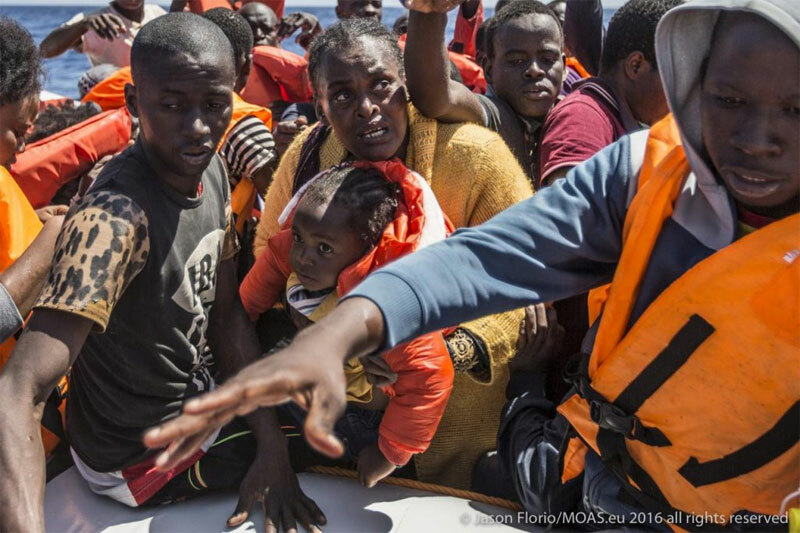 While many of those rescued may later have made new attempts to sail to Europe – and some of those may have perished – IOM, through its Assisted Voluntary Return and Reintegration (AVRR) programme, was able to repatriate some 3,000 migrants to sub-Saharan Africa in 2016. Many of those returnees had previously been rescued at sea. IOM Libya reports that the majority of rescue-at-sea operations have taken place in the western part of the country, with 13,024 people rescued off Az Zawiyah, 1,933 off Tripoli, 1,803 off Sabratha, 1,681 off Zuwara and 505 off Al Khums. Despite harsh winter weather and rough seas, migrants continue to embark on the perilous journey across the Mediterranean. So far in 2017, 184 migrants have been rescued at sea, despite the Coast Guard’s lack of seaworthy vessels and equipment. On 2 January, 119 migrants, including 87 men, 26 women and 6 children, were rescued off Al Khums. On 4 January, 65 migrants, including 60 men and 5 women, were rescued and five bodies were retrieved off Tripoli. Following the rescue operations, IOM distributed non-food items, including mattresses, pillows, winter blankets, clothes and shoes to the rescued migrants. IOM will be organizing first aid courses for three local Coast Guard offices in the most affected western area of the country. It is also working to increase emergency assistance to rescued migrants.